A failing abbey’s one hope is the golden apples in its orchard. Unfortunately, a herd of unicorns devours the apples each year. The abbot calls for heroes, but to no avail. No one can stop the creatures. When the duke’s son James is sent to the abbey for further education, he troubles all he meets with his constant questions. But his bravery and ingenuity may be just the right combination to banish the unicorns from the orchard forever. Great characters populate the story, from the monks to James and his family members. While unicorns are often heroes or forces for good in other stories, this time they cause all the problems. I found this refreshing and unexpected. Yolen’s usual mastery of storytelling keeps this simple tale spinning. Though we first begin with the monks and a short history of the abbey, the tale quickly becomes entertaining – especially once we meet James, the boy with the insatiable curiosity. This is a relatively short tale, just under 200 pages. Younger readers – probably second grade to fourth – would most enjoy the book. Many characters are monks at a monastery. There’s some mention of prayer and the task of copying and illustrating Biblical texts. Unicorns and heroes face off, and often the heroes end up the worse for wear. No graphic details. Battles are only briefly told and descriptions are sometimes comic. 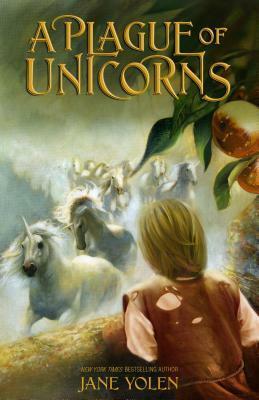 Tagged A Plague of Unicorns, Jane Yolen, Unicorns, Zondervan. Bookmark the permalink.